Used in the Modulation chain of the Marconi SWB Transmitter, see Item A0862. 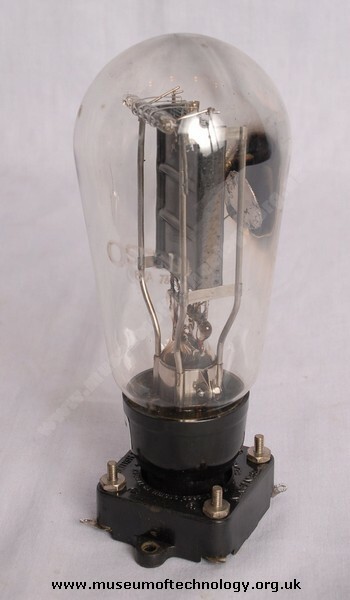 The PX25 was a Thoriated Tungsten directly heated filament, for 25 Watt audio outputs. Much loved by modern HI-FI aficionado's. In South Africa the Short-wave services of the SABC used a SWB11 transmitter with these valves in the modulator chain. The audio monitoring amplifier also used a pair of them in the output stage. The amplifier was prone to HF oscillation and one of my jobs was to neutralise them by the addition of capacitors. The quality obtained from a pair of these bottles in class AB1 was highly acceptable and it was no wonder they were the darlings of the audiophile community!